Tell us a bit about your Kawaiian Lion? 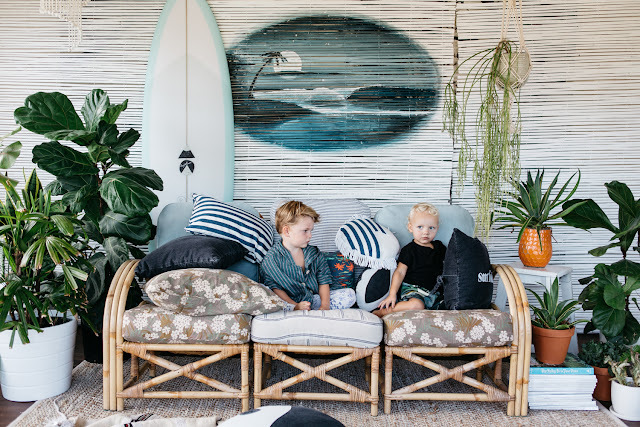 Kawaiian Lion is about homewares that you, your big dude and little ones can all enjoy. 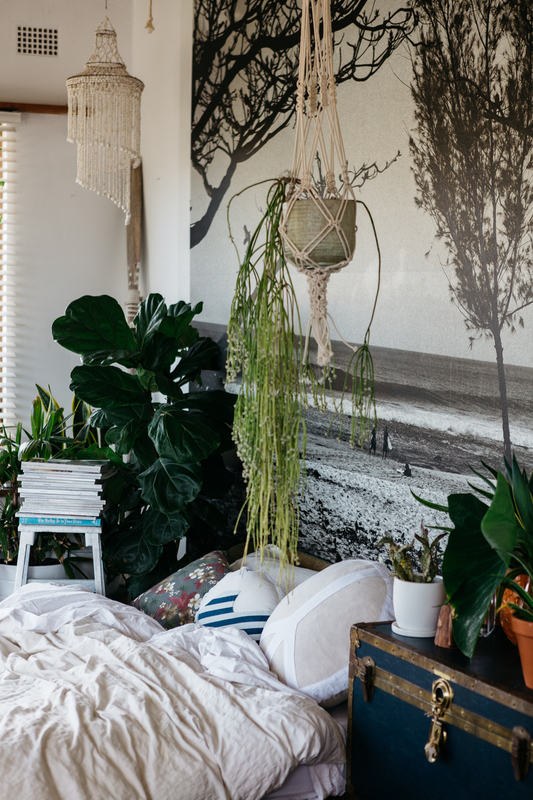 It is about hardy cushions and blankets that you can roll around, throw on the floor or take out to the beach with you. It’s about being inspired by vintage from the 60’s, 70’s and creating wallpaper and prints that embody the look and feel of a bygone era. We apply fashion techniques such as stonewashing to our cushions to create that super soft, like you’ve had this forever ever feel. I grew up in Western Australia, always wanting to escape the aridity and isolation. I became preoccupied with travelling from my late teens to mid 20’s living, working and playing overseas in Spain, Central America and Japan. I came back to Australia to return to design school, and catch up with family and destiny. I started out dressing windows at American Apparel after finishing design at RMIT university in Melbourne and moved onto working as a Visual Merchandiser for Sportsgirl, One Teaspoon and as a Creative for Topshop. From there, I took part in a blink and you will miss it TV show called “Top Design” which nudged me into the world of styling and interiors. After that, I begun freelancing as a props stylist making, sourcing and creating props and sets for fashion and commercial shoots. What sparked you to create your business? Itas a conversation I had with a close friend Laura Liles who started the label with me while we were selling wares at the Kirribilli market. We lamented how we could not find awesome cushions we dug with patchwork, airbrush prints, embroidery and in denim. With her design and production skills and my vision to realise this brand and my husband Desmond’s artwork, soon after we were creating our first range titled Love is an Island in 2013. It all came about very organically and naturally and it j.lust felt like it was the right thing for us to do at the time. Laura has since stepped back into the fashion world and starting her own label Kinga Csilla. What processes are involved in creating your pieces? I often dream about cushions. Yes, I know right. They infiltrate my waking and sub conscious state. My dreams are littered with ideas of stonewashed denim and patterns and I often wake up and draw down ideas I get as soon as I get up in the morning. Other times, just a small piece of fabric, a picture on instagram or a radical pair of jeans on etsy will set the wheels in motion to develop a new design. I source pieces from etsy and I enjoy translating vintage for a modern audience. I love finding motifs and techniques from the 60’s and 70’s and embracing them into Kawaiian Lion design for the home. Once an idea is sketched out, I drew up a specification sheet and send it to our maker in Bali who will develop the piece. We work back and worth adjusting the design accordingly. With all our denim, it gets made overseas and then sent back to Sydney to wash.
Our denim goes through a heavy stonewash process, similar to a pair of jeans will endure. Mounds of pumice stones are thrown in a massive turbine to roll over and over our denim to make it super ridiculously soft and worn.Then, if the piece requires printing, we take it to a bespoke printing house also here in Sydney and hand print all our sea-slang slogans. So by the time it reaches our customers, our Kawaiian designs have been touched by many a crafty hands. The original picture which sparked off this label and designs, to this day I still remember clearly.I was teaching English and painting surfboards in japan and loved going into tower records in Tokyo to read expensive magazines I could not afford to buy. I picked up a copy of the latest British vogue summer 2006, and flicked open to a shoot by the late photographer Corinne Day. She shot the then up-and-coming Gemma Ward for a swim summer shoot in the Northern Beaches. My mouth was agape. There were these incredible airbrushed surfboards with psychedelic colours and oceanography I had never laid eyes on before. I tore out the pic and kept it for years to come. To make a super long winded story short, I fell in love with an airbrush artist man along the way, ended up on the northern beaches a stone throw away from where the shoot had taken place and creating this label, having been inspired by a single photograph and all that it embodied. What do you love the most about having your own label? There are so many things. I love working from home. I am a complete homebody. I can make decisions without running them by others. I am able to process my creative ideas and action them into actual designs. I get to spend more time with my family, as I don’t have to commute anywhere to work. I enjoy the process of collaborating with other artists and finding this community of people who are tapped into the same zeitgeist. I feel ridiculously fortunate that this label has been embraced and found an audience who totally dig it. Martyn Worthington – an old fella who airbrushes original 70’s style boards down in Mona Vale. I really dig Japanese artist Hiroshige and his simplistic block prints, Macintosh and his decadent deco signature. I like the selby’s photographs, Tim Walker, rainbow fiends Aviator Nation, American patchwork from the depression era. Peggy Oki - the original dogtown girl, And my husband Desmond Sweeney who paints beautiful, dreamy, fantastical scenes. What is your favourite item in your store right now and why? The surfolk superpocket in stonewashed black denim, which holds my keys, nappies and randomn toys and snacks while looking vintage 80’s rock all at the same time and the Major Peace Out in sand linen - because of the patchwork peace detail, the super softness of the linen and how awesome it is to laze with on the lounge. What has been your biggest highlight? Featuring in Real Living and Broadsheet has been awesome but it’s really the little things. It’s the emails and instagram messages I get from customers who tell me how stoked they are with their Kawaiian goodies. It reminds me that I am doing exactly what I should be doing right now. There are moments where I feel bummed that I’m not saving the world, but then I remember, I am helping to save living spaces from an ugly hell. Kawaiian Nights – bedding linen range for big and little dudes. Is there anything else you would like to tell us about your business? It's not so much a business. It’s a lifestyle. It’s love. It’s family.